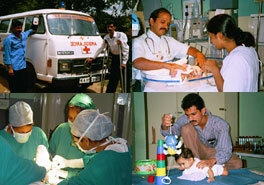 The Department of Physical Medicine and Rehabilitation at St. John's Medical College Hospital, Bangalore came into existence in April 1999. It aims to provide comprehensive, cohesive and cost-effective treatment and to re-integrate a disabled person into society. This is achieved by cohesively treating, teaching, training and mentally tempering the disabled individual through a combination of medical treatment, physiotherapy, occupational therapy, counseling and vocational training. Confused as to what PMR is all about? Learn more about Physical Medicine and Rehabilitation and the PMR Department at SJMCH. Planning to visit the Department? Find out about the different services offered by the department and read our guide to making appointments. Occupational Therapy : Occupational therapy is concerned with enhancing a disabled person’s functioning through training in specific activities and skills. Social Work: The ultimate aim of rehabilitation is to enable the disabled person to be a productive individual within society. The social worker’s sphere of action extends beyond the walls of the hospital to ensure that vocational rehabilitation takes place. In order to address the urgent need for more rehabilitation facilities in the greater Bangalore area SJMCH has decided to build a separate Rehabilitation Institute on the hospital grounds which will serve as a teaching institution and provide higher quality care to a larger number of patients. The institute is planned for 60 beds and thus will be able to receive 400 inpatients per year. The cost of the entire project is estimated to be Rs.135,000,000. While the institute will be financially self-sufficient on an operational basis, we are looking outside funding for the initial investment.